This article is about a United States military rank. For other countries that use a similar rank, see lieutenant general. Army, Air Force and Marine Corps three-star insignia of the rank of lieutenant general. Shoulder three-star rank insignia of lieutenant general for the above services. In the United States Army, United States Marine Corps, and the United States Air Force, lieutenant general (abbreviated LTG in the Army, Lt Gen in the Air Force, and LtGen in the Marine Corps) is a three-star general officer rank, with the pay grade of O-9. Lieutenant general ranks above major general and below general. Lieutenant general is equivalent to the rank of vice admiral in the other uniformed services. 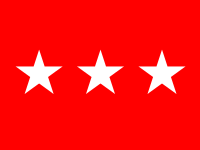 Rank flag of a lieutenant general in the United States Army. The flag of a lieutenant general of the Army Medical Department has a maroon background; the flag of a chaplain (brigadier general) has a black background. Flag of a United States Marine Corps lieutenant general. Flag of a United States Air Force lieutenant general. U.S. Army ASU insignia of the rank of Lieutenant general. Style and method of wear may vary between the services. U.S. Army "Class B" insignia of the rank of Lieutenant general. Style and method of wear may vary between the services. U.S. Marine Corps insignia of the rank of Lieutenant general. Style and method of wear may vary between the services. U.S. Air Force insignia of the rank of Lieutenant general. Style and method of wear may vary between the services. The United States Code explicitly limits the total number of generals that may be concurrently active to 231 for the Army, 62 for the Marine Corps, and 198 for the Air Force. For the Army and Air Force, no more than about 25% of the service's active duty general officers may have more than two stars. Some of these slots can be reserved by statute. Officers serving in certain intelligence positions are not counted against either limit, including the Deputy Director of the Central Intelligence Agency. The President may also add three-star slots to one service if they are offset by removing an equivalent number from other services. Finally, all statutory limits may be waived at the president's discretion during time of war or national emergency. The three-star grade goes hand-in-hand with the position of office to which it is linked, so the rank is temporary. Officers may only achieve three-star grade if they are appointed to positions that require the officer to hold such a rank. Their rank expires with the expiration of their term of office, which is usually set by statute. Lieutenant generals are nominated for appointment by the president from any eligible officers holding the rank of brigadier general or above, who also meet the requirements for the position, with the advice of the Secretary of Defense and the Chairman of the Joint Chiefs of Staff. The nominee must be confirmed via majority vote by the Senate before the appointee can take office and thus assume the rank. The standard tour length for most lieutenant general positions is three years but some are set four or more years by statute. Extensions of the standard tour length can be approved, within statutory limits, by their respective service secretaries, the Secretary of Defense, the president, or Congress but these are rare, as they block other officers from being promoted. Some statutory limits under the U.S. Code can be waived in times of national emergency or war. Three-star ranks may also be given by an act of Congress but this is extremely rare. Other than voluntary retirement, the statute sets a number of mandates for retirement. Lieutenant generals must retire after 38 years of service unless appointed for promotion or reappointed to grade to serve longer. Otherwise, all general officers must retire the month after their 64th birthday. However, the Secretary of Defense can defer a three-star officer's retirement until the officer's 66th birthday and the president can defer it until the officer's 68th birthday. An Army or Marine Corps lieutenant general typically commands a corps-sized unit (20,000 to 45,000 soldiers for an Army Corps and a similar number of Marines for a Marine Expeditionary Force), while an Air Force lieutenant general commands a large Numbered Air Force consisting of several wings or a smaller USAF Major Command (MAJCOM) such as the Air Force Special Operations Command or the Air Force Reserve Command. Additionally, lieutenant generals of all services serve as high-level staff officers at various major command headquarters and The Pentagon, often as the heads of their departments. Currently, five women serve as lieutenant generals in the US Army. After the close of the Second World War, generals were normally promoted permanently to brigadier general and major general, with temporary promotions to lieutenant general and general to fill senior positions as needed. In theory, a general vacates their three or four-star rank at the termination of their assignment unless placed in an equal ranking billet. Douglas MacArthur, who served as a four-star general and Army Chief of Staff, reverted to two stars after his CoS tour ended but chose to stay on active duty in the United States Army. The practice of using lieutenant general and general grades as a temporary rank continues, with the President and the Department of Defense creating temporary or indefinite three- and four-star assignments, with a fixed term of office, with the approval of the Senate. Even with the temporary status, such officers are also almost always granted permanent retirement in the last grade they held with the satisfactory completion of at least two or three years in grade. George Washington, the first officer to be appointed to the grade of lieutenant general. He was later posthumously promoted to General of the Armies of the United States in 1976. Leslie Groves, who ran the Manhattan Project and oversaw The Pentagon design and construction. William S. Knudsen, Director of Production, Office of the Under Secretary of War. The first civilian to enter the Army at that rank. Richard K. Sutherland, chief of staff to General of the Army Douglas MacArthur, present on the USS Missouri (BB-63) for the Empire of Japan's surrender signing. Lewis Blaine Hershey, head of the Selective Service System 1940-70, Lieutenant General 1956-70, then promoted to General, retired 1973 at age 79. Edgar S. Harris Jr., former Chief of Staff and Vice Commander in Chief of the Strategic Air Command and former Commander of the Eighth Air Force. Robert Sink, former Commander of the 506th Parachute Infantry Regiment (Band of Brothers), the XVIII Airborne Corps and the Strategic Army Corps. William Eldridge Odom, head of the National Security Agency under president Ronald Reagan, outspoken opponent of the Iraq War and warrantless wiretapping of US citizens. Thomas P. Stafford, U.S. Air Force, NASA astronaut, flew on Gemini 6A, Gemini 9, Apollo 10 & Apollo-Soyuz Test Project. Promoted to Lieutenant General in 1979 as Deputy Chief of Staff, Research Development and Acquisition, Headquarters USAF, Washington D.C.
Thomas L. Baptiste, Deputy Chairman, NATO Military Committee, Brussels, Belgium. ^ 10 USC 636. Retirement for years of service: regular officers in grades above brigadier general and rear admiral (lower half). ^ 10 USC 1253. Age 64: regular commissioned officers in general and flag officer grades; exception. ^  DoD News Briefing on Thursday, June 6, 1996. Retirement of Admiral Leighton W. Smith Jr.
^ "Knudsen the Only Civilian To Enter Army at His Rank", The New York Times, p. 9, January 17, 1942 . ^ Patricia Tracey, VADM, USN (Ret), was the first woman to be promoted to three-star rank (Vice Admiral, the Navy rank equivalent to lieutenant general, both being the military grade of O-9), on 13 May 1996.